Caught between jihadists and neo-Nazis, Swedish Jews fear for their future. When Carinne Sjoberg dissolved the Jewish Community of Umea in northern Sweden, she knew it would send shockwaves far beyond the small congregation that she had spent decades building. The move in May owed to intimidation by neo-Nazis, making it the first time in decades that a Jewish organization in Western Europe acknowledged that it felt compelled to close shop over safety concerns. Neo-Nazis from the Nordic Resistance Movement, beginning in 2016, pasted stickers with fascist imagery on Umea’s Jewish community center, “making the place look like after Kristallnacht,” Sjoberg said. The closure followed surveillance activity on the center by the neo-Nazis, who published details about individual visitors. “I didn’t take it lightly,” Sjoberg, a 56-year-old Jewish mother of two, told JTA about the decision to close. “I hate giving neo-Nazis this victory. But I can’t bear the responsibility for people’s lives, not under such threats,” she said of her city’s Jewish community of 70 people. 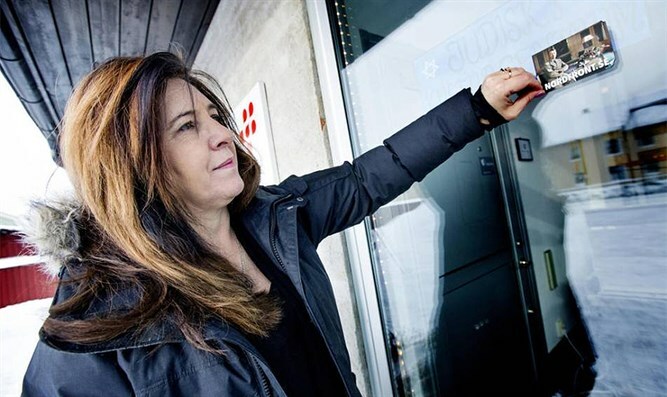 Carinne Sjoberg peeling off a sticker that neo-Nazis left on the door of what used to be the Jewish community center of Umea, Sweden. The closure caused a national uproar. Amid intense media coverage in Sweden of the affair, Prime Minister Stefan Löfven mentioned it in a speech denouncing anti-democracy forces in his country. But the indignation did little to change the fact that in Sweden, Muslim extremism and the far right are part of a broader set of challenges to Jewish communal life. So while the Jewish community of Stockholm may be growing, the problems are nonetheless causing some Swedish Jews to fear for their future as a minority here. “We have a vibrant community in Stockholm but even here we face multiple threats, from Muslim extremism to far-right violence,” said Aron Verstandig, president of the Council of Swedish Jewish Communities -- an umbrella group with approximately 6,000 members out of Sweden’s estimated 20,000 Jews. None of these challenges are unique to Swedish Jewry: Several Jewish communities in Eastern Europe suffer neo-Nazi intimidation, and many Jews in the continent’s west have experienced violence at the hands of radical Muslims. Nor are the problems connected to living as a religious minority in an ultra-secular society like Sweden’s endemic to this country; they occur across Scandinavia and beyond. But Sweden is perhaps the only European country where Jews are reporting a critical convergence of these issues. For example, far-right violence is not a real concern for Jews in France, where more than a dozen of them have died since 2012 in anti-Semitic attacks by Muslims. Conversely, Muslim extremism is not a real issue to the Jews in Ukraine, where far-right nationalists have recently assaulted several congregants. Which is why to some Jewish community leaders in Europe, Swedish Jewry is something of a test case for the rest of the continent. “The challenges that the Jewish community in Sweden face today are sadly indicative of far wider phenomena taking place across Europe,” said Moshe Kantor, president of the European Jewish Congress. In the southern province of Skane, a 15-year-old Jewish student attending a high school near Malmo suffers violent harassment at school both from ethnic Swedes and Muslim immigrants, his father said. Another beating involved an ethnic Swede who picked on the Jewish boy, the father said. His son boy “goes to school reluctantly. He doesn’t want to live here. He wants to move back to Israel as as soon as he turns 18, join the army and fight the Arabs. He’s become very right wing,” the father said. Stefan Dozzi, the secretary-general of the Sweden-Israel Friendship Association, also has firsthand experience of the dual threat facing Swedish Jewry. During the Almedalem political activism conference last week on the island of Gotland, south of Stockholm, he and another activist for the organization were physically assaulted by neo-Nazis who attempted to place their banner on the association’s flag in the group’s pavilion. It was the first time the pro-Israel group set up a pavilion during the Almedalen conference. The incident was widely reported in Swedish media. However, Dozzi said, “no one wrote about the intimidation by Muslims” at Almedalen. At least two men he described as Muslims told him they would burn the Israeli flag on display at the association’s pavilion. Dozzi said the flag was stolen during a break later that day. 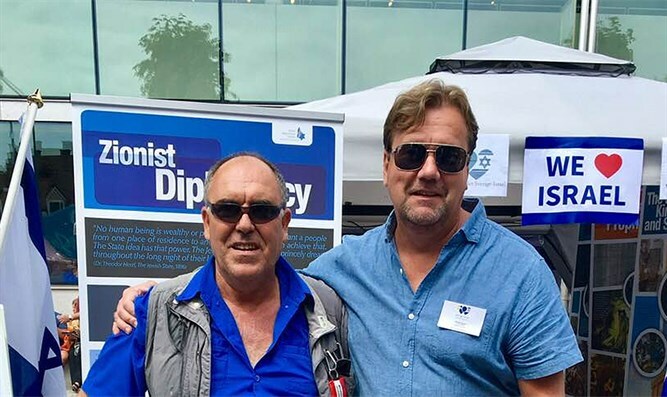 Stefan Dozzi, right, and Motti Toledano at the pro-Israel pavilion in Visby, Sweden, July 3, 2018. Such incidents involving Muslims are on the mild end of the spectrum. Last month, three Arab men were convicted of hurling firebombs at the synagogue of Gothenburg in southern Sweden in December after President Donald Trump announced the US Embassy in Israel would be moved to Jerusalem from Tel Aviv. It was one of several attacks on Jewish places in worship in southern Sweden in recent years, and especially in Malmo, where a third of this city’s population of 350,000 is Muslim and about 1,000 residents are Jewish. Jihadism and neo-Nazi anti-Semitism “feed off one another” in Sweden, Sjoberg said. The arrival of hundreds of thousands of Muslims to Sweden starting in the 1970s generated “less tolerance to people who are perceived as foreign,” emboldening the far right. “I don’t think they would have dared to go after us like this 15 years ago,” Sjoberg said. The boldness of neo-Nazis in Sweden seems unusual for Western Europe, where law enforcement agencies in many countries with bitter memories of Nazism have a relatively low tolerance for far-right shenanigans. In 2015 and 2017, skinheads twice disrupted lectures in Swedish schools by Holocaust survivors. And in Gothenburg last year, hundreds of neo-Nazis marched on Yom Kippur to celebrate their hateful ideology. The original itinerary had them passing by the synagogue, but city authorities made them avoid it. Part of the problem, Sjoberg said, is that Sweden was never de-Nazified after World War II -- it was officially neutral but in practice collaborated with Nazi Germany. “There was massive support for the Nazis, but none of the reckoning against collaborators that happened in occupied countries after liberation,” she said, referencing the dismissal of collaborators from positions of influence and prosecutions in France, Italy, the Netherlands and beyond. In Umea, authorities lack the determination to stand up for the Jewish community, Sjoberg said. Talks with the city on moving the Jewish center to a secure location ended abruptly last year, she said, when authorities put the intended space up for rent and backed out of an agreement to turn it into a JCC. “They were giving us the run-around, not keeping to agreements and leaving us twisting in the wind when we were being targeted by neo-Nazis keeping track of our comings and goings. I had to pull the plug,” Sjoberg said. Umea’s deputy mayor, Margareta Rönngren, disputed her account of negotiations. In addition to violent harassment, Swedish Jews also need to deal with strict secularism on the part of authorities that sometimes encroaches on their customs. Ritual slaughter of animals is illegal in Sweden, and although ritual circumcision of boys under 18 is allowed, banning the practice is a constant subject for debate. A Jewish couple in Gothenburg, a Chabad rabbi and his wife, are facing hundreds of thousands of dollars in fines for insisting on homeschooling their children. And in March, two Cabinet ministers called for shuttering all faith schools. Yet even against this backdrop, Jewish life has prevailed, at least in Stockholm, according to Petra Kahn Nord, the community’s spokeswoman. The capital, she said, has three synagogues, a JCC with a kosher shop and a newly opened Jewish library. 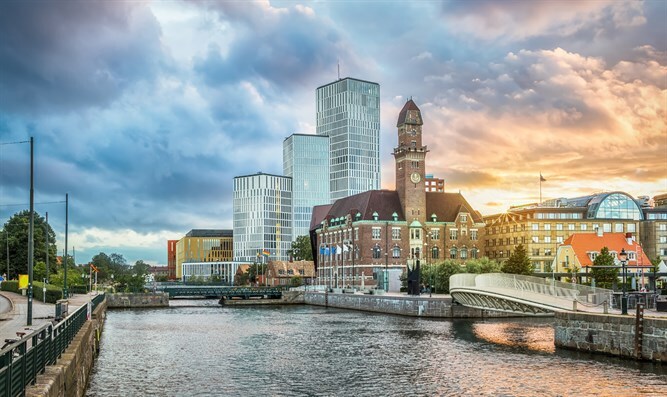 Stockholm also has a Jewish kindergarten and a Jewish school “with a long waiting list,” Kahn Nord said, adding that the community in the city is growing with a lively participation of young congregants and at least one Limmud Jewish learning conference annually. But this success feeds off other communities, like Malmo, where there are so few Jews left that the Jewish kindergarten there now has mostly non-Jewish children, Kahn Nord acknowledged. She said some Jews from her hometown of Malmo, Gothenburg and beyond leave for Stockholm because of harassment.